Wow, despite my best efforts I just haven’t been able to keep up with my blogging. I’ve read quite a few blogs where this has happened…and the writer genuinely apologizes for not posting in so long and clearly it was simply that little thing we call “Life” that got in the way. For me, however, that is not the case (although I was really tempted to sit down and say that I just got busy and therefore could not blog…but a liar I am not!!!) I honestly just haven’t been feeling like it….despite my best efforts to plan out what delicious recipes or interesting tales I want to share I just don’t sit down and do it! So…today I am getting back into the groove. Speaking of getting back in the groove, I’ve been pretty much staying on task with my Weight Watchers and eating pretty good (well except for those Curly Fries I inhaled last night! ), but this has also been a challenge. Again, I have very good intentions and plan all of my meals, prepare all of my food in advance to make life easier, but still sometimes I just don’t feel like eating a salad…and so it is quite easy to bring on the french fries. 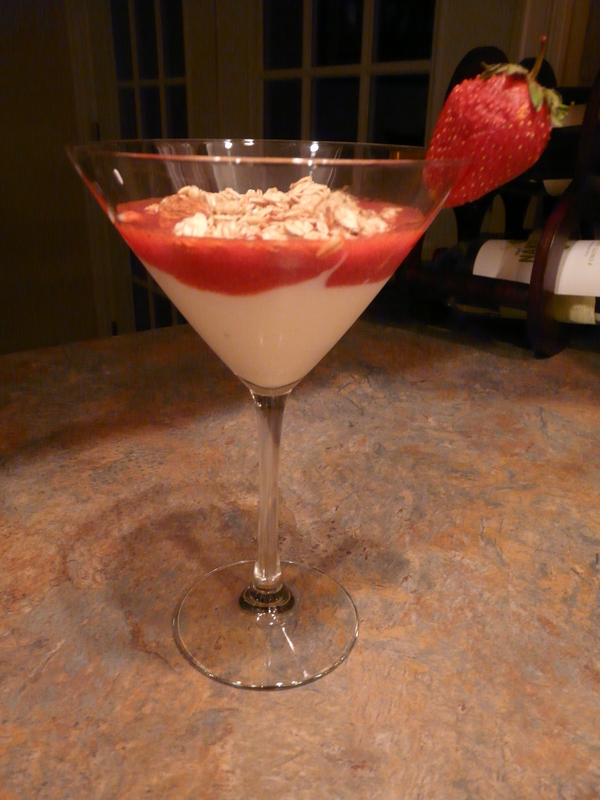 Anyway, earlier in the week Hubby took me to Whole Foods (stay tuned for my Whole Foods post) and all that fresh local produce and healthy stuff inspired me to make this delicious strawberry yogurt parfait for our dessert the other night. Hubby rated it a “5”!!! That’s right a “5”!!!! The best he could give me based on our little rating system. 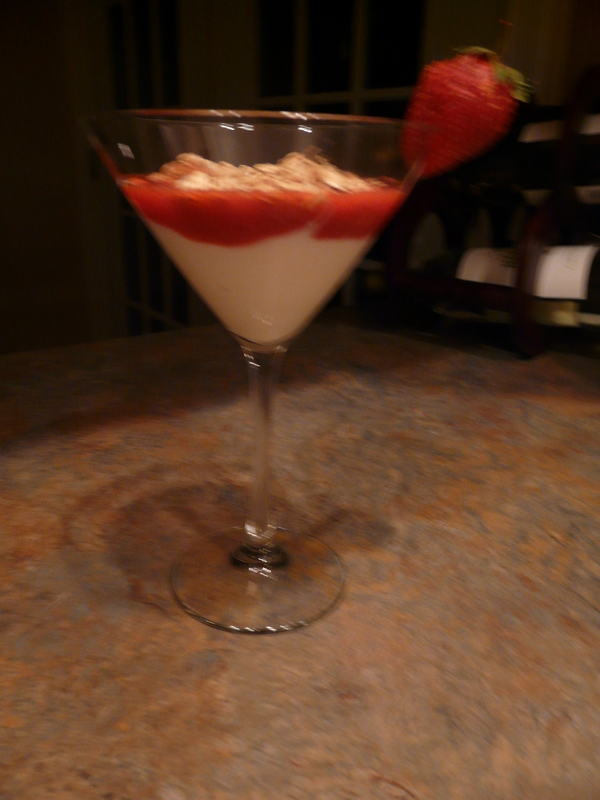 I was happy I made something so yummy, yet so easy and most importantly something healthy that we both enjoyed. The Weight Watchers Points Plus value is 6, however you could replace the honey with artificial sweetener (such as Splenda) and you can use another kind of yogurt like Dannon Light & Fit Vanilla and it will help reduce the points plus value. Also, I highly recommend you use “Raw Honey” if you can find it (Whole Foods carries it and a lot of Farmer’s Markets). It is sooooo much better than the regular honey you typically find in grocery stores. The first time I ever sampled it at a little store in Lancaster County I was totally hooked!! I guess like most foods…natural always tastes best. puree strawberries and honey in a blender. Add 1/2 cup yogurt to a serving dish. 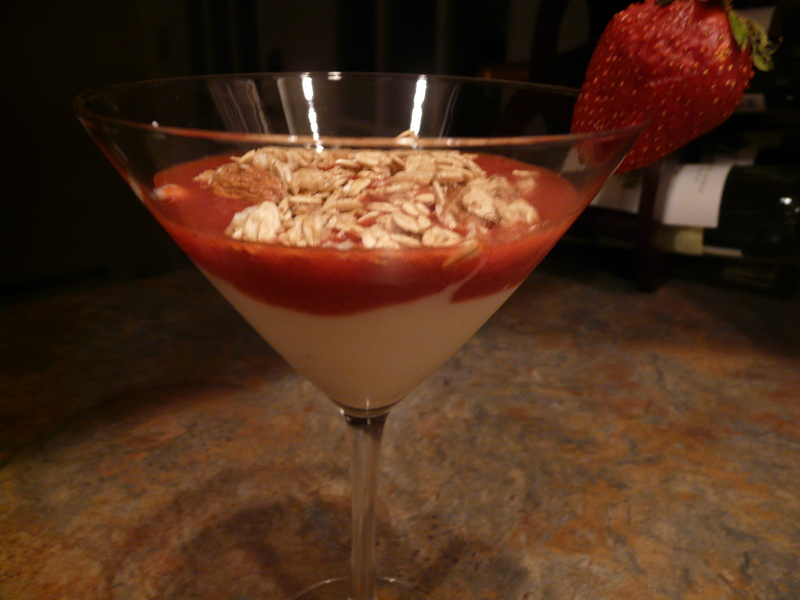 Top with half of the strawberry puree and 2 tbsp. of the granola.